Single-handedly constructed and decorated with sculptures by its owner since around 1980, above pictured house in Lutsk, Ukraine, is a very special art environment/singular architecture. 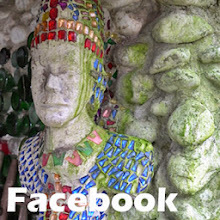 Nicholas Golovan, the builder of the house and creator of the sculptures, was born in 1943 in Teremne, Ukraine. His parents -a carpenter and a seamstress- in 1946 moved to Lutsk, a city in northwest Ukraine, where Golovan currently still lives. At a young age Golovan already showed artistic qualities and his parents stimulated him to go to an art academy. His mother hasn't experienced it, because she died in 1958, but indeed, young Golovan in 1960 was admitted to the art academy in Lviv. He studied there until 1965 and then returned to Lutsk, where he built a studio in the yard of his father's house. He married in 1971 and in the same year he had his first exposition. Golovan became active as a sculptor especially in the Volyn region where Lutsk is located, creating sculptures and monuments, usually intended for the public space. When he was looking for a place to build a house that would serve as family home and studio, in the late 1970's the authorities allocated him a piece of land in a part of the old town bordering the river Styr. 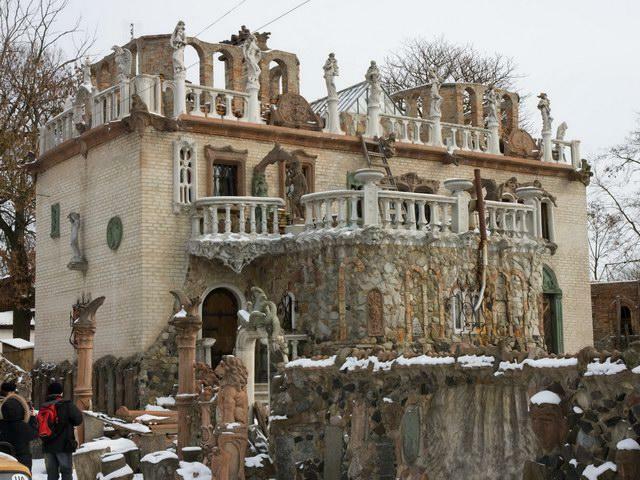 Golovan got constructional and architectural assistance from the architect Rostislav G. Metelnytskyy, but he did the construction works himself, brick by brick. This resulted in a rather special architecture: a three-story house with balconies and balustrades, a large round staircase to the entrance and a large walled garden in front and on the backside. 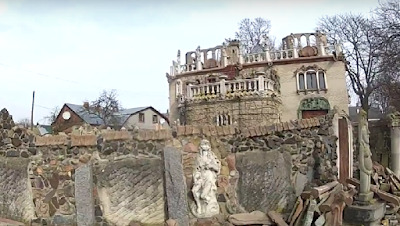 Golovan decorated the house with a variety of sculptures, arranging a series on the balustrade on the upper front side and another one on the bottom of the wall along Luteranska street, but then there are also hundreds of both small and large sculptures scattered over the property. The yards around the house contain large quantities of boulders awaiting to be processed, as well as other materials. 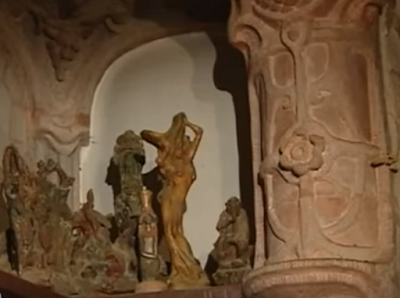 The interior of the house has also been abundantly decorated with sculptures and high reliefs. The pictures in this post just give a limited idea of the multitude of decorative sculptures in various styles included in, on and around this house. However, the internet has a number of websites with series of pictures of this house and Youtube has various videos (see documentation). In terms of constructing Golovan is a non-professional, but his sculptures show he has mastered sculpting completely. 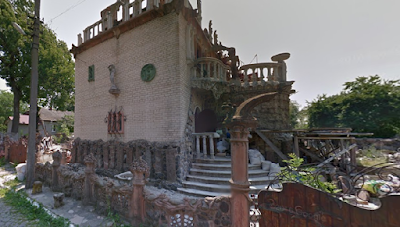 In any case an entry of this site in this weblog, an inventory of european (outsider) art environments, is quite rightly, just as a local tourist guide ranks the site amongst the town's major worth seeing buildings, such as its castle, tower and churches. The inhabitants of Lutsk in general respect Golovan and his art environment. The city in 2016 has decided to appoint him as honorary citizen of the city. The award ceremony took place on August 20, 2016. * Video Скульптор Микола Микитович Головань (Sculptor Nikolai N Golovan), 1979, 21'11", added to Youtube by Volodymir Marchuk, january 2012. With scenes of the constructing of the house.